We all sit and watch Comic Relief, get a bit tearful, donate a tenner. It’s not until you get the chance to go out to Africa and see it for yourself that any of it makes any sense. Last week I was lucky enough to get that opportunity. Along with five friends from our local business community, Emily Chapman (Loud Monkey), Sam Dallas (Medway Bridge Marina), Anthony Opie (Opies), Nick Gillott (Nick Gillott Photography) and Olympia Brightley-Hodges (my little sis) I ventured to Uganda for a long weekend. Led by the wonderful Angus Wilson, Director of Fields of Life and CEO of Wilson’s Country, it was a truly life-changing couple of days. 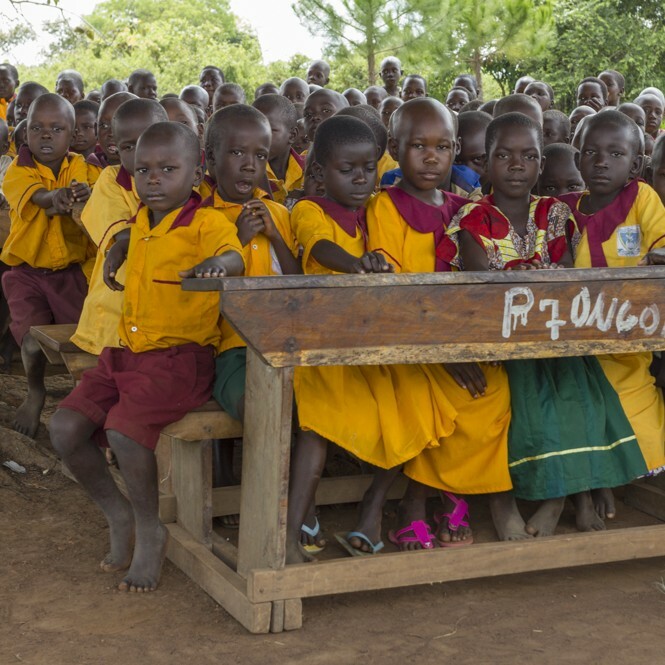 Organised by an Irish charity called Fields of Life (FoL), the five day, whirlwind tour of their charity projects in Uganda was an intense insight into how the money they raise has a life-changing impact on the people of the country. 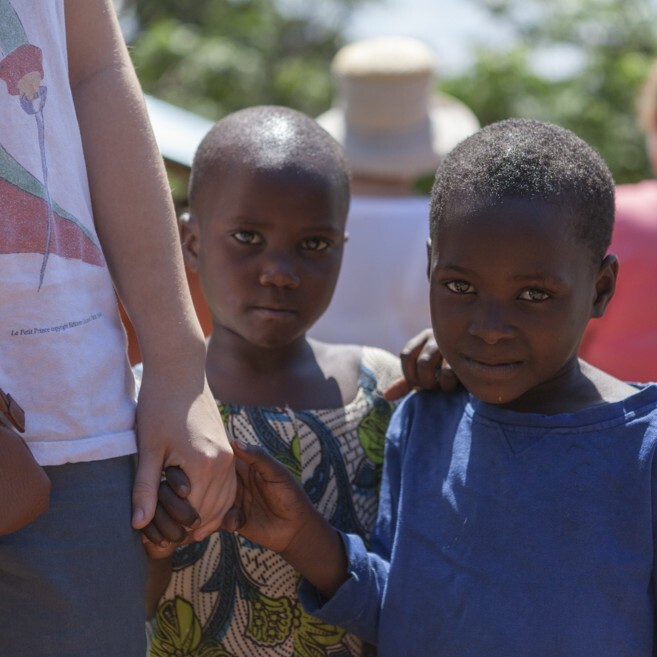 Fields of Life are passionate about two main things – delivering quality education to the children of Africa and providing clean drinking water to rural communities. 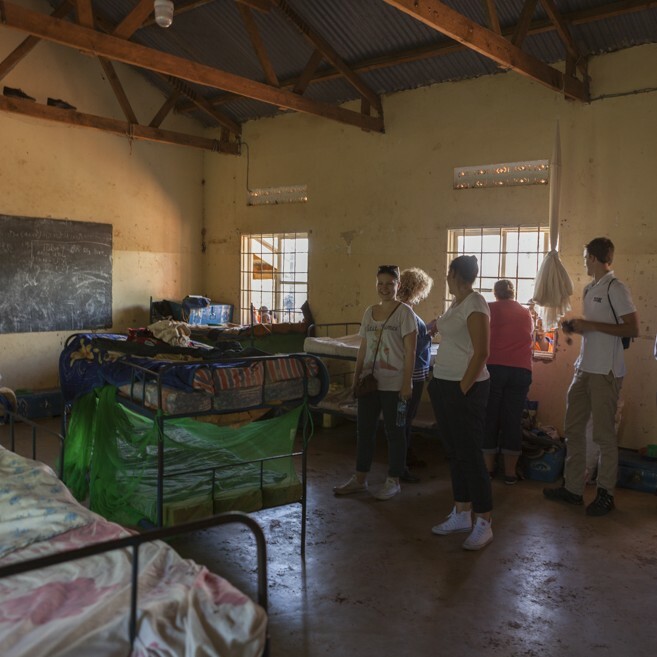 During the course of our trip we visited three FoL schools and were able to see how far they had come since investment from FoL. I was particularly struck by a woman called Jennifer who started a school from the front room of her tiny house in the slums of Kampala. More and more parents sent their children to her and soon she was bursting at the seams, despite her husband building lean to’s, extensions and trying to make do with the limited space they had. 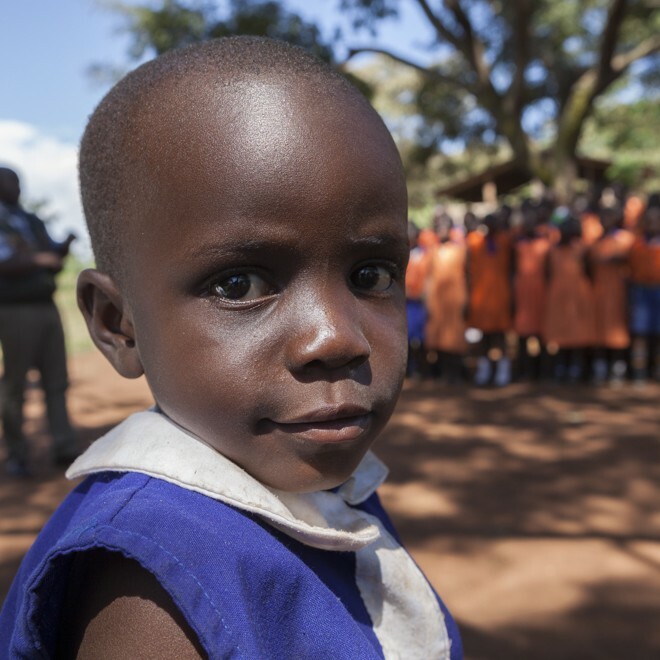 Eventually, with funding from FoL, Jennifer built a secondary school high on a hill just outside Kampala’s city centre. It’s basic but it provides exactly what the students need – a safe, welcoming environment to learn. What’s more, the children are working at a level far higher than those in the UK; I was blown away by their perfect English, immaculate handwriting and the complexity of what they were learning. It’s all testament to Jennifer’s dedication. It’s clear to see that she LOVES what she does, it’s her life and she has given those young people a chance in life. It was painful to see that the younger children in her nursery are still in the original house where it all began. It can only be described as a building site and is certainly not where these young children should be. But the part of the trip which really knocked my for six was seeing our ‘Brightley-Hodges’ drinking well being dug in a small rural village. 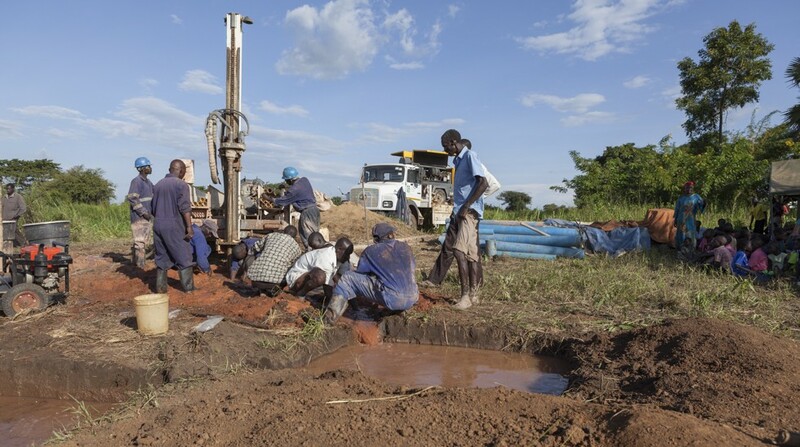 It was the very first well to be dug as part of the ‘WellGood‘ campaign and was a result of my Mother’s fundraising climb to the summit of Mount Elgon earlier in the year when she raised over £5,000 for Fields of Life. £3,600 of that went towards providing this well; a total lifeline for the people of the community. I couldn’t help but get tearful when meeting the men, women and beautiful children who will no longer have to walk miles every day to get clean water. And all because our little family in Kent decided to do something and raise a little bit of money. Along with seeing the rest of the FoL projects, this gave me and the rest of my group the fire in our belly to want to come home to the UK and do something. We’re planning several fundraising events and are determined that this is just the start. The start of something special and a commitment for life. And so how can the rest of the family business community get involved? Join the ‘WellGood‘ campaign and sponsor a drinking well for just £3,600. Whether you do it as a family, as a business …. or as a family business! Know for certain that the money you raise will have a REAL and life-changing effect on thousands of people. I went to a fantastic seminar this morning with some great speakers talking about marketing and websites. The words ‘marketing strategy’ often strike fear into a small business owner. It means big agency, big fees. Right? Wrong. Marketing starts with you and getting to the bottom of what really makes your business tick. The foundations of marketing are built on a great brand. Get your brand right and the rest will follow. So how do you ‘get’ a great brand? Think about what makes the heart of your business beat. Write down the first five words that come to mind. Forget long-winded mission statements, forget what other people tell you it should be. What values really lie at the heart of your business? Clarity: is it clear what you do, what you’re selling, who you audience is? Forget industry jargon, speak your customer’s language. Are the visual elements of your brand clear eg your logo, advertising, website etc? Consistency: Your customer should have the same experience however they come in contact with you. Is the message on your website the same story your sales people are telling? Does walking into your shop feel the same as browsing your website? If you took your logo away, would your customers still know it’s you? Visibility: Are the visual elements of your brand (logo, adverts, signage etc) congruent with what you stand for? A face-to-face meeting is rarely the first time someone comes into contact with your brand so all of your communication tools have to be in order. Invest in great design. Continuity: Whether your business has been around for 2 years or 200 years, the customer wants to know that you’re experienced in your field, that you are a trusted business with a good track record. Testimonials are a great way of demonstrating this. Finally, don’t underestimate the power of the web. By 2015 more people will be accessing the internet on a mobile device (phone, ipad etc) than on a desktop computer. If you’re not on Twitter, LinkedIn, YouTube, Facebook you should be. Because your customers are and your competitors are. Family businesses are often shy when it comes to promoting themselves online. 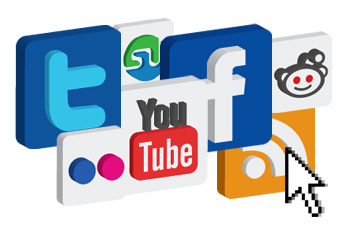 The press team at Family Business Place talk through ten easy steps to getting started with online social media. 1. Plan your attack. Don’t jump in feet first without a strategy. It’s easy to get carried away without any real goals which will just end up in you wasting your time. 2. Decide why you want to use social media. To promote a product? To get customers into your shop? To raise brand awareness? Define your goals before you start. 3. Define your audience. Are you talking to other businesses? Consumers? What demographics do you want to target? 4. Where does your audience hang out? Facebook isn’t just for teens, Twitter is a great way to talk to the press, Pinterest is really useful for people planning a wedding. Find out what platforms your audience use. 5. What are you going to say? Be useful, be the place they come to for the latest news in your sector, provide interesting and compelling content. No more than 1 in 10 updates should be promotional. 6. Pace yourself. It’s easy to launch with 10 videos on YouTube, 20 Tweets a day and 10 Facebook updates. But is it sustainable? Better to do fewer things regularly than lots of sporadic efforts. 7. Involve the whole business. Your content will be far more interesting if you get opinions from other members of your team and even customers and suppliers. What do they think is a hot topic? 8. Be part of the conversation. It’s called ‘social’ media for a reason – make sure you engage with people, reply when someone contacts you and don’t rely on auto-responders. 9. Deal with complaints, don’t just ignore them. Social media can leave you open to angry customers but tackle them head on. It will also make you look at where you went wrong in the first place. 10. Online won’t replace offline. People still like to do business face to face but social media is a great support tool and can reinforce your message. If you’re a small family businesses (less than 10 employees), the Press Team at Family Business Place can look after all of your PR & Social Media for just £250 a month. Call Amalia on 01732 220 120 to arrange a free brainstorm. Anita Brightley-Hodges, Managing Director of Family Business Place knows that social media tools can be an invaluable part of any family business’s marketing strategy. But companies also need to be aware that every tweet, status update and photo share has a consequence, whether it’s good or bad. There’s no disputing that the recent phenomenon of social media, namely Facebook, Twitter, LinkedIn, YouTube, Instagram, Google+ and Pinterest has transformed the way the world works. Companies can no longer read from the traditional marketing text book, they need to study their client’s buying behavior online and adapt their strategy appropriately. Can they build a loyalty to their brand through Facebook? Manage their reputation on Twitter? Network with prospects on LinkedIn? Marketeers will tell you, there’s no handbook for social media. It takes strategy, management and monitoring in order to adapt on an almost daily basis. Get caught snoozing and a dozen of your competitors will have already overtaken you and be speaking to your customers. However, lets not forget that online social media platforms are exactly that: social. Whilst companies spend millions agonising over how to reach their audience online, the average Joe is oblivious and is more concerned with seeing their friends’ pictures from Saturday night, watching videos of a latest dance craze and stalking their favourite celebs. Whilst for most of us this is harmless daily fun, for many involved in a family business, the impact of what they say and share online can have significant consequences. There is often a huge blur between the work and private life of someone at the helm of a family business. Sure, their PR team have probably told them that it’s great to get their name out there, raise their profile a little and let customers engage with them directly. But unless what they are saying is being monitored, this could cause all sorts of problems. I recently started following someone on Twitter who runs a large family business manufacturing food. At first I was intrigued to see some behind the scenes photos of the factory, hear what he had to say about new regulations and gauge his opinion on trends in the market. But after a few weeks, I was ready to unfollow him. Many of his tweets were full of profanities, and shameless plugs, he was constantly attacking other brands, never replied to my questions and I had absolutely no interest in his weekly knees up with the boys. A real shame, when his family business brand is one of family values, integrity and customer service. But in a completely opposite example, I’m also connected with a tiny family company local to me who produce organic products for the home. In this instance, the business owner IS the brand. Her updates are funny, useful, relevant and totally in line with the values she portrays for her business. I feel like I’ve really got to know her, her passion for the company and the organic market at large. When I asked her a question, she replied immediately and invited me down to her shop. So I popped in and bought my mother a beautiful hamper of products. When I got home, one of the bottles was damaged so I sent her a message on Twitter to ask if I could come in and buy another one. Instead, she had two more delivered to my home as an apology. Here are two distinct examples of how social media platforms can be used. On one hand, it can do more damage than good. The food manufacturer clearly doesn’t have a PR team to manage what he is saying online. It also makes me think that he’s not a particularly nice man to work for and I have deliberately steered clear of his products in the supermarket. I wonder if he realises the consequences of what he’s saying in his 140 twitter characters? On the other hand, social media can be an invaluable tool in engaging with customers, managing complaints and ultimately, making a sale. The organic lady is a great example of how to make social media an integral part of your business. If you make a plan, discuss with your team what message and values you want to portray, and ensure they whole business believe in it, you’re on to a winner. With today’s consumers distrusting of banks, corporates and high street chains, its no surprise that the UK’s family business sector is thriving. Independent retailers on the high street are seeing customers return during the difficult times, fond of the personal service and family values that lie at the heart of most family businesses. And although historically they have a reputation for being small and often old-fashioned, times are changing and family firms are embracing new technologies and innovations. What’s more, they have an intrinsic sense of responsibility and are often huge employers of local people, great philanthropists, and ambassadors for entrepreneurship. Take John Jones MBE for example. Recently awarded the Lifetime Achievement Award at the national Red Ribbon Awards for family business. John’s company manufactures bespoke frames for some of the world’s greatest pieces of art. Not only has John built an incredible business from nothing, he has also left a legacy for his children to carry on for generations to come. Communicate – Make sure you listen to each other and articulate your thoughts before it ends in an argument. Don’t just assume the other knows what you want or think. Define your roles – There’s nothing worse than not knowing what’s expected of you or treading on each other’s toes. Identify where your skills lie and take responsibility for that part of the business. Separate work from play – It’s inevitable that things are going to get heated, there will often be a difference of opinion. But these things are work-related and shouldn’t impact your relationships on a personal level. When you’re away from the office, be AWAY from the office. Have fun – When things are tough it’s good to have a close shoulder to lean on. And when times are good, who better to share it with than your brother, mother, son, sister? Family businesses are there to be enjoyed, a chance for you to create something truly special together. What’s it all for? – Family business owners are often the ones in the office at the weekend, not taking holiday, and staying awake all night. But don’t forget that a family business can also afford you the opportunity to leave a legacy; do great things in the local community, support charitable causes and create business that your children are proud to carry on. In these difficult times, every company needs to stand out from its competition. By entering your firm for awards, it creates an opportunity to shine a spotlight on your business and show the world why you are the BEST at what you do. 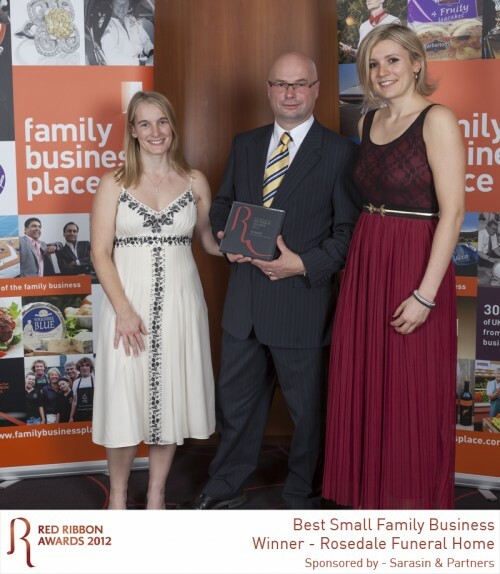 As hosts of the Red Ribbon Awards – the UK’s only national awards ceremony for family-run businesses, we’ve seen some really wonderful award entries, and some which need a little help. If you think that you truly deserve to win the category you’ve entered, shout it from the roof top. Average businesses don’t win awards. Your business needs to be spectacular. But spectacular doesn’t necessarily mean big, or a high turnover, or thousands of employees. You just need to be great at what you do. So why on earth should you spend time entering yourself for an award? You’ve got stuff to do, a business to run….right? Nominating yourself for an award is a great way to shout about your accomplishments. At the Red Ribbon Awards, we’ll help you use it to get press coverage both locally and nationally. Include employees in the nomination process; why do they love working for you? What makes them proud? They’ll love that their opinion counts. The Red Ribbon Awards Ceremony provides a great chance to network with other family-run business owners. Meet others with shared values and who like doing business with fellow family firms. People like to work with successful people. Awards are a marque of excellence, a reason for new customers to consider you over the competition and for current clients to feel great about their decision to work with you. After the glitz and glamour comes the best bit – the sense of achievement in the office, a shared pride with your employees and an acknowledgement that you’re building a thriving business for generations to come. This year, why not look to some of your local producers for Christmas food instead of the big supermarkets? Some of the country’s finest businesses are family-run and produce the most exquisite products. We featured a handful of family businesses in a previous issue of Generation magazine, so why not check them out and support the UK’s family business sector?